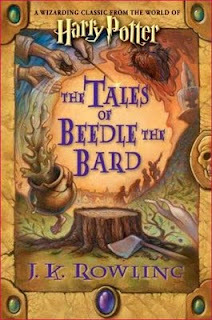 “The Tales of Beedle the Bard” is one of J.K. Rowling’s latest addition to the Harry Potter saga. The book was purportedly translated by Hermione Granger from the ancient runes, as written by a certain wizard named as Beedle. The stories within the book is accompanied by notes written by Hogwart’s headmaster Albus Dumbledore and was completed around eighteen months before we was murdered in the Astronomy Tower of Hogwarts. J.K. Rowling also added her own notes for the benefit of muggle (non-magical) readers. The book is a collection of five short stories, which according to Rowling is the equivalent of our fairy tales. The story has various themes that aims to teach young wizards and witches a piece of life’s lessons. The Wizard and the Hopping Pot, which is about a young wizard who inherited a magical pot from his kind father. The pot never leaves the young wizard’s side, all the while emulating the townsfolk hardships and illness, until the young wizard was forced to help the needy townspeople. The Fountain of Fortune which is about the adventure of three witches and a luckless knight to the magical fountain that gives eternal fortune to a single adventurer once every year. In the end, each of them received what they wished in an unexpected way. The Warlock’s Hairy Heart is about a certain wizard who chose to hide his heart and avoid suffering the weakness which is love. It is a tragedy which tells us the futility of human desire to making himself invincible. Babbitty Rabbitty and Her Cackling Stump is about a foolish king who desired to gain immense magical power, but in the end was revealed as a fool by witch named as Babbitty. The Tale of the Three Brothers is the story about three brothers who received gifts from Death after successfully escaping him. The story was already told in “Harry Potter and the Deathly Hallows,” the seventh and last installment in the Harry Potter series. I like this book the way I like fairy tales, especially the original versions collected by the Grimm brothers. Reading a story in this book makes me think of the stories of King Arthur and the adventures of the Knights of the Round Table. It is magical, as if it was really written by some bard ages ago. What I also like about this book is the way it supplements the Harry Potter series. Here, Albus Dumbledore speaks directly to the reader. Some mysteries are explained like the reason why Rowling’s wizards and witches chose to hide themselves from the world. The only problem that I have is its price. I believe that the book was steeply priced at around 800 Philippine pesos (or roughly around $ 16), since it only contain around five short story. The pricing is too much. Maybe they pegged the book’s price at this amount so as to adequately help the Children’s High Level Group. However, sans the steep price, the book is quite excellent. The Tales of Beedle the Bard is truly a J.K. Rowling masterpiece.